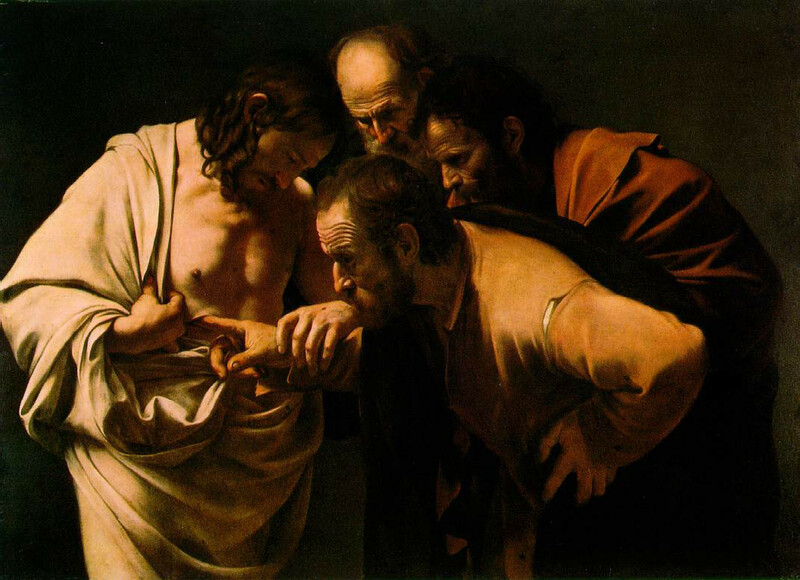 Today we hear the famous post-resurrection encounter of Jesus with ‘Doubting Thomas’….. who refuses to believe that Jesus has truly risen unless he can put his fingers in his wounds. Why did Thomas dig his heels in and refuse to believe that Jesus was Risen? Why did he demand special proof? Why wasn’t he as satisfied as the other disciples? Because Thomas loved Jesus –and when we love we also know that our heart has been exposed to being hurt. Anyone who has experienced the death of someone they love….. anyone who has seen a relationship disintegrate…. Anyone who has been left by someone they love knows the hurt and pain that follows. From the disciples perspective, Jesus’ mission had ended so abruptly. After witnessing the miracles, seeing the great crowds… Thomas was convinced that Jesus was the Son of God. He had left everything to follow him and then in confusion and fear he had witnessed his arrest, he had run away to save his own life but heard about Jesus being tortured, heard about his public and humiliating death. The experience of Holy Week that we have just passed through had left the disciple frightened, disorientated and disillusioned. So stubborn Thomas, having been so deeply hurt because of his love for Jesus, is reluctant to raise his hope again. When we human beings are hurt so often we react like hedgehogs and curl up into a little ball, nursing grudges, becoming angry and bitter. But look at Jesus’s response – Jesus who had been abandoned by his disciples, who had been tortured and killed in a humiliating way – but now the risen glorious Jesus, still bearing his wounds, his first words are not of blame and retribution but of peace and mercy. ‘ Peace be with you ‘ and to Thomas ‘ Doubt no longer and believe’ … and Thomas makes one of the most beautiful declarations of faith in the Bible ‘ My Lord and My God’ – and then Jesus commissioned to the Disciples to spread this message of peace and mercy, the forgiveness of sins. The difference between our human experience of being hurt, and how we nurture grudges and find it difficult to forgive and the divine mercy is great. So it is beautiful that Saint John Paul II has named this Sunday Divine Mercy Sunday and dedicated it to the visions that Sr Faustina of Krakow had just before WW2, She died a year before the Nazi’s occupied Poland which lead to some terrible years, firstly with the Nazi Occupation and followed by the Communist Occupation, a period which John Paul referred to as the crucifixion of Poland. The most famous of the visions was the lord revealing his sacred heart with rays of white and red light flowing from it as we can see at the font of the church by the lectern …. Coming at the start of the 20th Century – the most violent, most genocidal, most hate filled period in world history ….. In the face of this violence and hatred – God reveals his mercy. I think we should take this invitation seriously. As well as an increased participation in the Sacrament of Confession – so that we can experience God’s Mercy …. Let’s remember the seven corporal works of mercy are: 1. Feed the hungry. 3. Clothe the naked. 4. Shelter the homeless. 6. Visit the imprisoned. 7. Bury the dead. And the seven spiritual works of mercy are: 1. Counsel the doubtful. 7. Pray for the living and the dead. Anyone who is interested in how we can implement this more – students and non-students …. Come and see me …. We already have exceptional things like the foodbank, homeless runs, running breakfast clubs in local primary schools but we can do more … come and see me if you are interested. How will you respond to this extraordinary Jubilee of God’s Mercy?